Will Myanmar Become A Conduit For Iranian Crude Into China? On June 1, sometime between the US withdrawal from the JCPOA in early May, and its demand in late June that Asian buyers fully halt Iranian oil purchases, PetroChina snuck in a shipment of Iranian crude through Myanmar to its Yunnan Petrochemical refinery in southern China. On any other route, this would have been just another Iranian oil shipment. But using the Myanmar-China oil and gas pipeline brings new complications. That’s because the pipeline has a new avatar - it is now a part of China’s Belt and Road Initiative, along with other large infrastructure projects that were not originally a part of BRI, but were included later to boost the profile of the program. Sending Iranian crude through an oil pipeline with the “Belt and Road” label removes any doubts of whether BRI’s projects have political motives or not. For critics of BRI, it adds fodder to the narrative that the infrastructure plan is a tool for China to undercut the influence of the US. BRI already has a serious public relations problem and is viewed with suspicion, sometimes for good reason. Earlier this week, the renewal of US secondary sanctions on Iran faced strong opposition from the remaining JCPOA signatories. China has made it clear it will continue to import Iranian barrels, and using a BRI project to do so will give the US ammunition to criticize BRI openly, potentially leaving the host country open to US reprisals. BRI has not been particularly polarizing so far, and its participants have included US allies. Oil and gas pipelines are magnets for controversy, however. From the Sumed pipeline in the Middle East to Nordstream 2 in Europe, there hasn’t been an international oil or gas pipeline that was devoid of geopolitics. Myanmar will be no different. The Panama-flagged Dore delivered its cargo of Iranian crudes at Maday Island on June 1, the only vessel to have shipped oil from Iran to Myanmar since the 13 million mt/year (260,000 b/d) Yunnan Petrochemical refinery in southern China started operations in August last year. Dore’s cargo of 948,000 barrels of crude oil included 474,000 barrels of Iranian South Pars condensate. The refinery said it also processed 56,000 mt of Iranian Heavy crude received via the 1,420 km pipeline, Platts reported previously. This was the first batch of Iranian Heavy crude processed by a PetroChina refinery, and is unlikely to be the last. Iranian grades contain a relatively higher amount of metallic and chloride contaminants that corrodes refinery units, due to which some of PetroChina’s biggest refineries like Dalian Petrochemical and Guangxi Petrochemical, were unable to crack the crude. Yunnan Petrochemical has a 1.2 million mt/year delayed coking unit that enables it to process Iranian crude, and it has already tested the first cargo successfully. Other major Chinese refineries under Sinopec have used Iranian crudes and found them attractive because of a high naphtha yield, which is needed for petrochemical products. 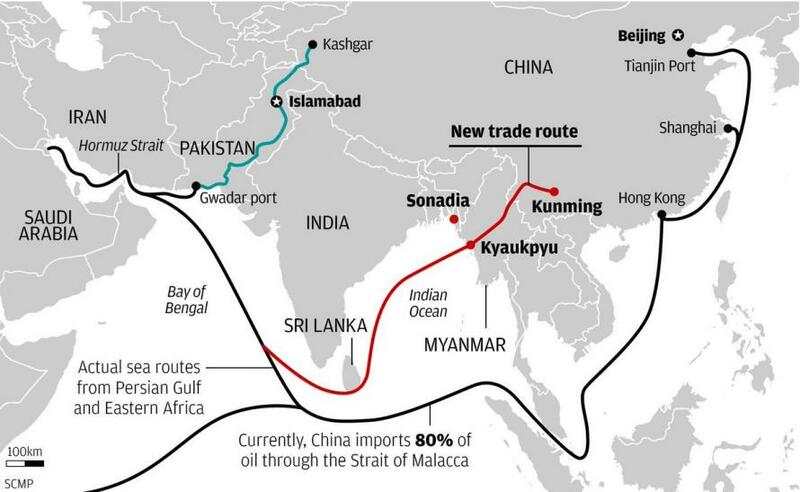 All of this paves the way for the China-Myanmar pipeline to become a conduit for Iranian crude, even if it is for just one refinery, which if fully utilized will account for nearly a third of China’s intake of Iranian crude. China’s imports of Iranian crude were around 638,000 b/d in the first half this year. The Myanmar-China pipeline runs from Maday Island, near the town of Kyaukpyu in Rakhine state, and connects with China’s domestic pipeline to Kunming city in Yunnan province. It is fed by a deepwater VLCC terminal and tank storage farm, and was negotiated with the former military government of Myanmar. State-owned Chinese media now call it a “pioneer project” of BRI. The final question is around the implications for Myanmar, and the legal complications for players in the Iran crude supply chain, like pipeline operators, shipowners, ports or banks involved. “In respect of persons involved in transporting or storing petroleum from Iran, there is a risk that they could be subject to US sanctions,” Clyde & Co Partner Avryl Lattin said. Sanctions or other punitive measures of the Trump administration are often considered on a case-by-case basis, such as special waivers given to India to import Russian military equipment because of its position as a budding strategic partner of Washington’s Indo-Pacific strategy, Collin Koh, Research Fellow at the Maritime Security Programme of the Institute of Defence and Strategic Studies, Singapore, said. “It depends a lot on how the target country weighs in significance within the US strategic calculus. Myanmar is certainly not one country that the US can afford to alienate now,” Koh said. 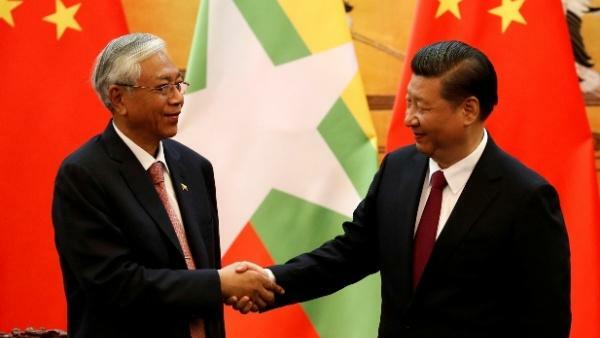 There are signs that Myanmar wants to turn towards China due to the Rakhine issue, but at the same time Naypyidaw is more amenable to Western concerns and interests than ever before, He said. Due to this, even India and Australia are careful in their treatment of Myanmar. So the US may not want to exacerbate the situation by imposing punitive actions on Myanmar just because Iranian oil was piped through its territory to southern China, Koh added. “The concerns are long-term geopolitics,” he said.